We recently published a three step guide to starting a CX program based on this method. Download our Community Banking CX Blueprint here to get a jumpstart on your CX planning. Bain surveyed 133,000 banking customers across 22 countries in late 2017 about their experiences with financial institutions. The bubble size corresponds to the number of respondents who had experienced each touchpoint. Word of Mouth was not included in the original survey and its placement was estimated based on external information. Source: Bain/Research Now Customer Loyalty in Banking Survey, 2017. 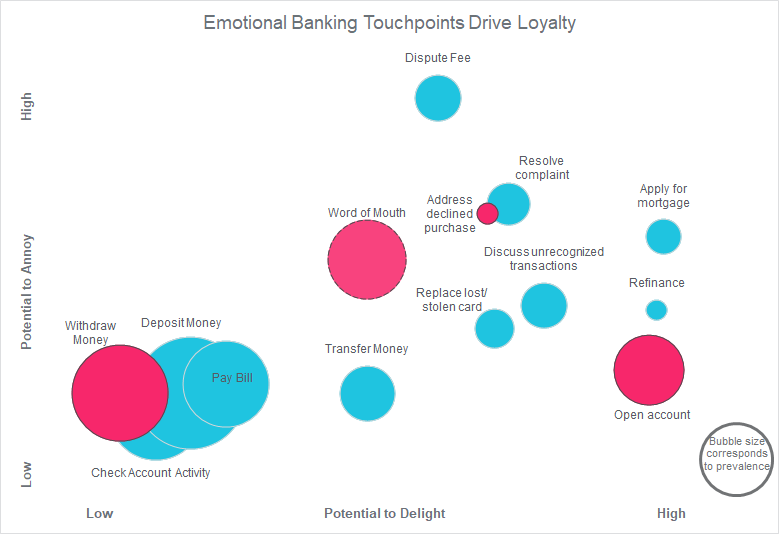 A good customer experience program monitors the most important touch points with your bank. In order to receive feedback from as many customers as you are able, the first few touch points you choose should be common occurrences. Every customer opens an account, so that is common. While not every account allows for withdrawals, most do, and most customers will withdraw funds at least once a month. Therefore, it is common enough. While you may not have an exact measure of your word of mouth, according to The Financial Brand, it drives nearly one fifth of account growth. It too qualifies. However, purchases are declined infrequently, and even then customers do not always reach out to address the issue, so it is not common enough for our purposes. The ultimate goal of the customer experience program is to improve the customer experience, in order to improve retention and enhance cross-sell opportunities. (For a comprehensive source on the financial benefits of a customer experience program, check out our Banking CX Money Map.) If the touchpoint you have chosen does not have the power to delight or annoy your customers, these improvements will prove difficult. As the above chart from Bain illustrates, account openings, declined purchases and word of mouth all hold the power to both annoy and delight. There are opportunities in all three for your bank to both remove frustrating roadblocks and create memorable experiences. However, withdrawals do not hold this power. Customers expect it to work, of course, but banks perform this function quite well. As a result, there is a much smaller opportunity to improve the customer experience for this touchpoint. Touchpoint surveys need to be sent soon after the event occurs. Surveys should ideally be sent within 24 hours for the touchpoint to be fresh in the customer's mind. Therefore, you need to be able to trigger a survey when the event occurs. Your bank should have easy access to timely data on account openings, withdrawals, and purchase declines, so these all qualify. However, word of mouth data can be much more difficult to acquire. Access to online word of mouth data can be purchased through third parties, but the American Marketing Association found that only 8% of such conversations take place online. Missing over 90% of these events will severely bias the results, and thus word of mouth does not qualify as identifiable. While opening an account was the only touchpoint of these examples to satisfy our three criteria, it is by no means the only touchpoint to start your survey program. Your first few touchpoints should be selected based on your needs, just be sure they are common, emotional, and identifiable. For further information about getting a customer experience program started, see our recently published blueprint here. For specific information on writing a touchpoint survey, read our blog here. And stay tuned to our blog for help on designing an action plan based on your survey results.